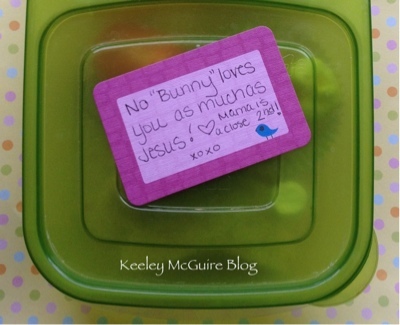 Gluten Free & Allergy Friendly: Lunch Made Easy: Some Bunny Loves You! Lunch Made Easy: Some Bunny Loves You! Little Miss has a Bunny shaped gluten and nitrate free turkey and cheese sandwich, on gluten free bread. He has a mini marshmallow smooshed and stuck on with a dab of honey for his tail (I saw this idea over at Bobbi's Bentos - so cute). The cupcake liner in the main compartment contains Pirates Booty (gluten and nut free, aged cheddar puffs). 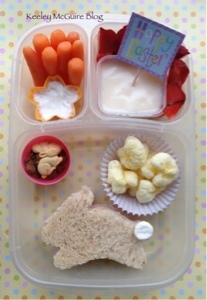 Top left are the bunny's favorite - carrots of course ;-) with dip. Top right is a small container with vanilla yogurt with freshly diced strawberries around it so Little Miss can mix them in when she eats it. Plus a festive "Happy Easter" pick. When it comes to times of year like Christmas and Easter, we try our hardest to make sure Little Miss knows the "reason for the season" - that Jesus is at the core and all the other stuff is just for fun. It's not about a basket full of candy, but the gift that He gave to us. 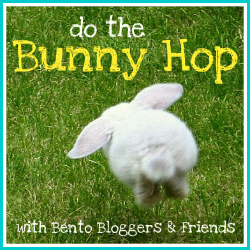 I mean, Bunny Hop to check out all the Easter/Spring/Bunny lunches!! Next up: The FABULOUS Chef Corey of FamilyFreshMeals! Absolutely adorable! She's going to love it! What a sweet note and adorable lunch! You are to cute Keeley. What a fun lunch. That bunny tail is to die for! Super adorable and I love your sweet lunchbox note! I love that note! Very cute Mama K! Oh this is so cute! Thanks for the great idea! Aww, love the marshmallow tail trick, very cute! Super tasty lunch! !